I am having trouble finding a consistent answer to my problem while designing a low level deck that will have a pergola above. I don't know if I should notch the support post to accept the beam. Picture a deck with a 6x6 column in each corner. Each column will carry the load of the deck. 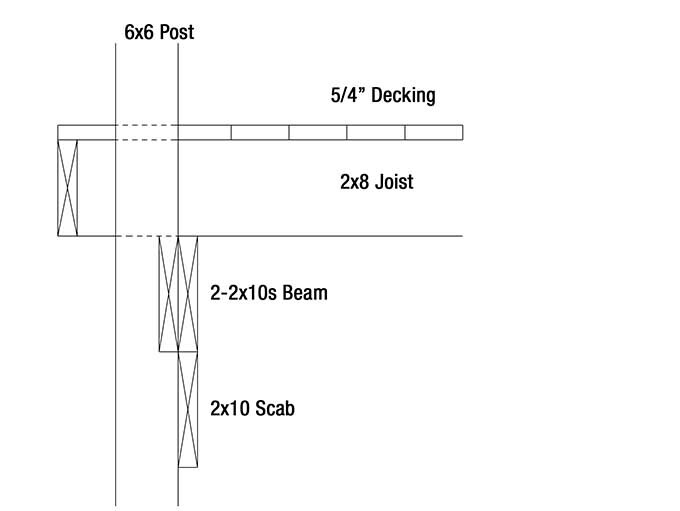 For the sake of argument, the beams to support the deck will be double 2x10" PT lumber. The columns that support the deck will also be the same columns for the pergola. The 6x6 column is supported by a poured concrete footing. The deck is about 2 feet off the ground, and the pergola will be about 8 feet above the ground, so the column will be about 10-11ft long. So, how do I attach the beam to this column to support the deck, while at the same time retaining structural integrity for the pergola? Everyone, including building code is against sandwiching the beam (and i understand why). However, If i notch the column to accept the beam, I will be removing 60% of the material in the column (to accept a double 2x10"). This to me creates a major weak spot in the column to support lateral movement of the pergola. What is the best practice here to do this? Or is standard practice to mount a pergola column between the joists and rim joist (this just seems like a weak structure to me)? Your instincts are right in the sense that if you remove 50% of the width of a post and then impose a moment load against the top of the post the post will be much weaker in the zone where the post is narrower. This would apply very aptly in a free standing post application and also in a guardrail situation. But here you are building a pergola which has at least four sides and is all connected into a single three dimensional geometric shape. The posts are connected to roof beam which are in turn connected to roof joists. And you may even have bracing from the post to the upper beams. All of this creates a very rigid unitary structure. So your worries are not as big a problem as you might think. However, in keeping with your concern I have provided one possible building technique where you are only notching the post for one of the two 2x10s in the beam. Below the outer beam you will scab by way of carriage bolts if you wish, a shorter piece of 2x6 or 2x10 against the post. Then bolt the beam to the post with carriage bolts. This arrangement is going to be very strong for your joist support and will still leave you with a very strong series of support posts for the pergola. There are surely other ways to do this but this would work well.